HALIFAX -- The long-awaited fatality inquiry into the death of an Afghan war veteran who killed his family and himself in rural Nova Scotia is expected to begin early next year -- more than two years after the killings. Renovations to a municipal building in Guysborough, N.S., are expected to be completed by the end of this month, said Jennifer Stairs, a spokeswoman for the judiciary. "We understand this an extensive and complex process," she said in a statement. "However, it is important that we take the time to plan and prepare now, to ensure the inquiry proceeds as smoothly as possible once it starts hearing evidence." When provincial court Judge Warren Zimmer was appointed to lead the inquiry in July, Stairs had said the hearings were expected to start later in the year. She said crews are still working on the hearing room and hooking up recording equipment for video conferencing and live-streaming capabilities. "Renovations were required to ensure the space meets the needs of the judge, counsel and others expected to participate," she said, adding that the work didn't get started until the fall because the province had to negotiate a lease with the municipality. As well, the provincial Justice Department didn't issue a tender for live-streaming services until this week. 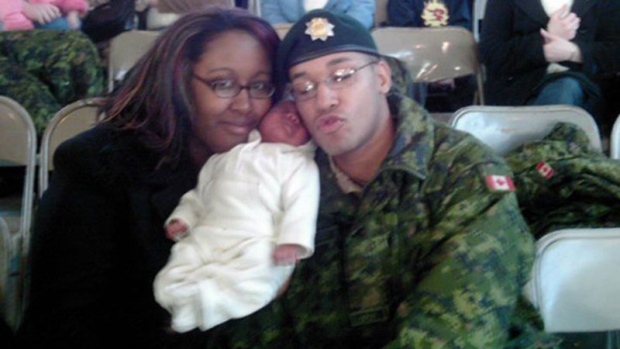 Lionel Desmond, 33, was diagnosed with PTSD after serving two tours in Afghanistan in 2007. On Jan. 3, 2017, he shot his wife Shanna, 31, their 10-year-daughter Aaliyah and his 52-year-old mother Brenda before turning the gun on himself in the family's rural home in Upper Big Tracadie, N.S. Among other things, the inquiry will examine whether Desmond had access to mental health and domestic violence services -- and whether he should have been able to buy a gun. It will also look at whether the health-care providers who interacted with him were trained to recognize occupational stress injuries or domestic violence. The provincial government promised the inquiry in December 2017, and its terms of reference were later released in May. Members of Desmond's immediate family have long complained he did not get the help he needed from federal and provincial agencies. Cassandra Desmond -- who lost her mother, only brother and his entire family in the murder-suicide -- has said she hopes the inquiry will brings lasting change to help prevent similar deaths. She and her twin sister Chantel fought a lengthy battle advocating for the inquiry. The sisters have said Desmond was a radically changed man when he was medically discharged, and returned home in 2015. They say his outgoing sense of humour had dimmed and, more importantly, he seemed withdrawn and in a defensive posture much of the time -- as if he was still in combat mode. A leading expert on judicial probes has warned that the inquiry may be limited in its scope when it comes to matters of exclusive federal jurisdiction. Ed Ratushny, a professor emeritus at the University of Ottawa's law school, has said the provincial inquiry could be prevented from investigating the roles of federal departments, including Veterans Affairs and National Defence. Veterans Affairs Minister Seamus O'Regan has pledged full co-operation with the inquiry. The last time a fatality inquiry was held in Nova Scotia was almost 10 years ago.